In my experience as a church goer and a leader in the church, the church has more women than men. I have also noticed that many churches offer more for the women than they do for the men. And so it seems that it is easy to run out of topics for Women’s meetings. I hope that this resource is helpful as you minister to the women in the church. Ephesians 5:25–27 Husbands, love your wives, even as Christ also loved the church, and gave himself for it; That he might sanctify and cleanse it with the washing of water by the word, That he might present it to himself a glorious church, not having spot, or wrinkle, or any such thing; but that it should be holy and without blemish. 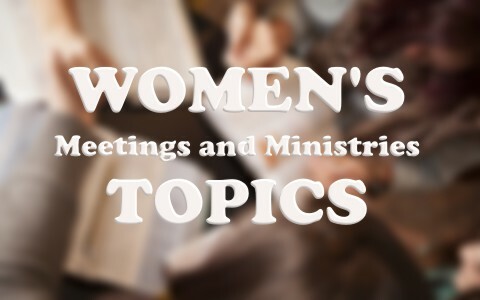 The Bible is rich with topics for Women’s meetings and ministries. The topics and Scriptures above are sure to enhance your ministries as you study and learn together.